This recreation center honors Staten Island’s first Borough President, George C. Cromwell (1860-1934). Educated at Brooklyn Polytechnic College, Yale University, and Columbia Law School, Cromwell settled in Staten Island in the 1880s. He served on the New York State Assembly from 1887 to 1889 and became the President of the Richmond County Parks Commission in the 1890s. With the consolidation of the five boroughs in 1898, Cromwell became the first Borough President of Staten Island, serving until 1913. He enacted several crucial pieces of legislation during his tenure, including the Fish and Oyster Protection Bill, and a bill to remove the “Government Cholera Burying Ground.” He went on to be the primary developer of the Dongan Hills community, and served on the State Assembly again from 1915 to 1918. In 1934, the Works Progress Administration (WPA) converted an 11 year-old pier into this waterside recreation center, at a cost of one million dollars. The WPA was a massive public works program, initiated by President Franklin D. Roosevelt (1882-1945) as part of his New Deal that aimed to revive the American economy during the Great Depression (1929-1941). Opened in 1936, the George Cromwell Recreation Center soon came to play a vital role in Staten Island’s sports and recreational activities. President Roosevelt hosted a gala ball here in 1939, and Sugar Ray Robinson fought his last amateur fight here in 1940. From 1938 to 1974, Parks and the Department of Docks jointly operated the recreation center. Beginning in 1974, Parks agreed to take full responsibility for maintenance, while the successor to the Department of Docks, the Department of Ports and Terminals, reserved the right to tie up and unload vessels as long as it does not interfere with the recreation center. In 1990, Parks purchased $60,000 worth of gymnastics equipment for a training facility at the center. The equipment included balance beams, uneven bars, mats, a tumbling strip, pommel horses, a competition bar with a 500 pound base, competition high bars, a spring horse, and a pair of competition rings. In 1992, the City Parks Foundation donated $10,000 for the initiation of rhythmic gymnastics, youth basketball, and midnight basketball programs. In 1994, Staten Island Borough President Guy V. Molinari sponsored a $5 million renovation, including an overall structural rehabilitation, an exterior refurbishment, new gymnasium floors, new bathroom facilities, an expanded nautilus room, new multi-purpose rooms, and a new reception area. The facility accommodates dance and aerobics classes, and boasts numerous resources including a boxing ring, a print shop, and a conference room. Inspired by its location, the exterior design features a pallet of green, blue, and turquoise decorated with wave motifs and other elements from the sea. Staten Island’s first Sports Gallery was opened in 1996 in the lobby of the center. Created by Staten Island Borough Parks Commissioner Thomas Paulo, the exhibition opened to coincide with the beginning of the 1996 summer Olympics. The gallery now showcases work from the center’s art, computer, and photography classes. Offering everything from the REACH program, for special needs population, to an after-school program to sports clinics to grant programs for senior citizens, the center caters to people of all ages and needs. An estimated 100,000 people now pass through the center each year. In 2000, the center was closed during a renovation that provided pier stabilization and additional structural improvements, with $5 million in funding from Mayor Giuliani and Borough President Molinari. 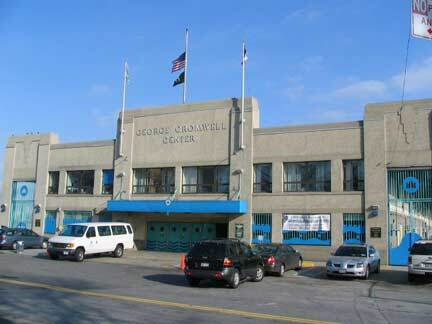 For information on the George Cromwell Recreation Center’s programs or hours of operation, call (718)816-6172.